As of last weekend, Fro is officially back. 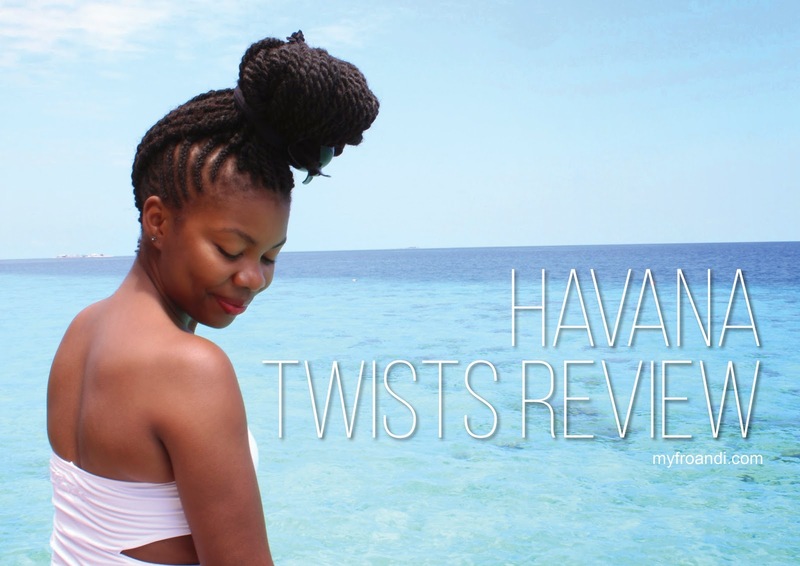 So now that I’ve had my few weeks with the havana twists and really tested them on my honeymoon, it’s the perfect time to get back to you with a review of the style. 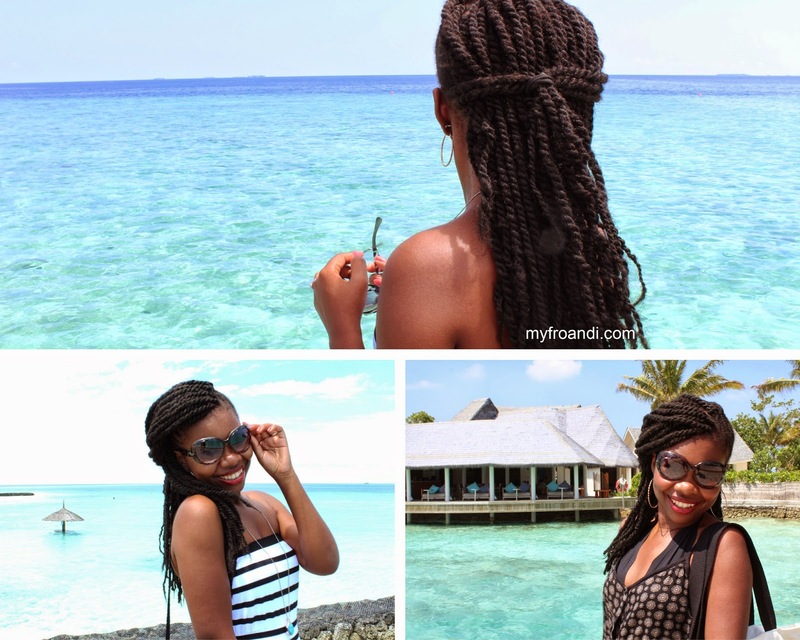 I thought it fitting to have my first protective style of 2015 to be the style I rock whilst on honeymoon. 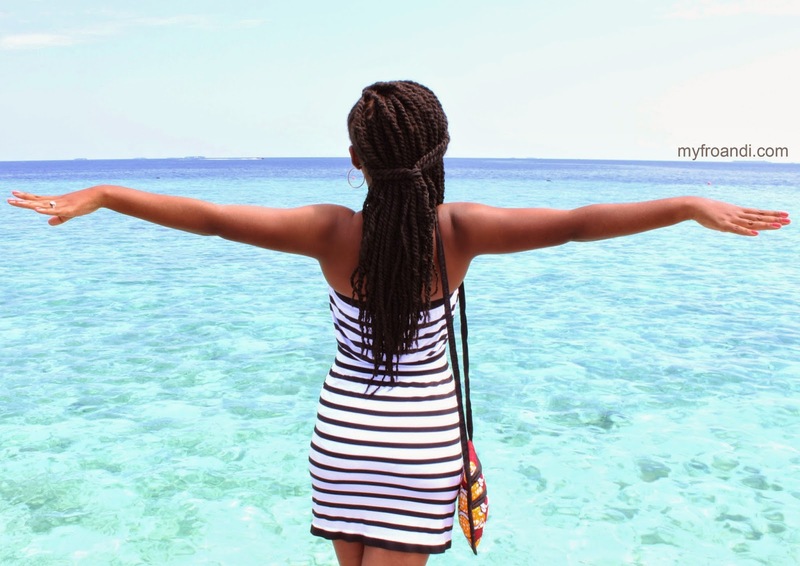 We went to the magical islands of The Maldives. Side note: if you want to experience heaven on Earth, this is where you need to go. It’s as breath-taking as the photos – actually the photos don’t even do it justice. You have to see it for yourself. I wasn’t familiar with the climate of The Maldives so wouldn’t have been able to come equipt with a damage control plan should my fro freak out. We’d be swimming often so I needed something that would be easy to get in and out of the water without having to worry about the tangled mess my fro becomes after dipping it in the ocean. Time – I wanted to have a completely lazy, worry-free time with my husband and hair wasn’t something I wanted to even blink about. In essence, the hair ticked all three requirements. I was initially worried that the amount of hair used was too much and would get very heavy when wet – which it actually did but what surprised me about it was that it dried very quickly. 20 minutes in the sun and I was good to go. Another worry I had was that it would be too bulky to fit into my new beach hat. So Ruutos graciously accepted to re-do my side cornrows a few days before I left, to lessen the extension load by making them a bit longer so there were less single twists in the middle. So after they edited the hair, my head just fit into my hat. Weight of extensions: The hair itself is heavier than Marley hair. I’m not sure if the exact same style would be achievable with Marley but it’s worth a shot to avoid the heaviness. Longevity: It didn’t last as long as other hair extensions. I had it in for a total of four weeks, and by the beginning of the fourth, the hair was looking ratty. It did the job and I wasn’t expecting it to last much longer than when we got back to Joburg but it started fraying about a week and a half in. Having said that, I was swimming multiple times a day, every day for a whole week so that type of activity surely had an effect on it. Washing: It was easy to wash. The cornrows made it much easier to get to my scalp and wash it. Of course, there’s only so much washing that I could do to remove the sand that eventually accumulated in there even though the actual amount was much less than I expected. 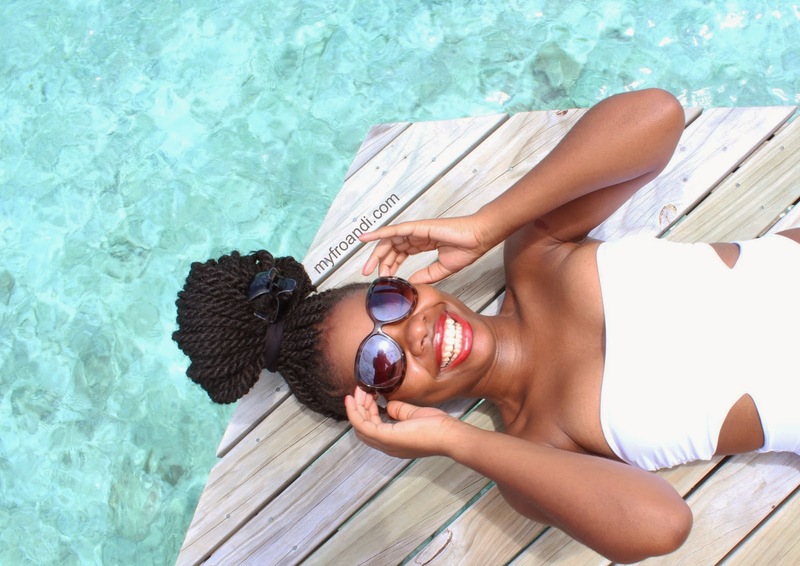 Versatility: I wanted to have something that I could easily put up into a big bun when snorkelling and also rock down and it did just that. The length of the twists looked allowed me to create a big bun (photos above) and the length also looked really pretty with dresses and my hat. And I often just pulled a few twists from both sides and simply tied them with a small hairband to keep them out of my face (photos below). Maintenance: I stuck to my ol’ faithful products when I’m in a protective style: Restore Plus Moisturising Spray and a bit of my DIY hair butter. I’m not going to lie, I wasn’t diligent about wrapping it every night. This definitely also affected the longevity of the style. I wasn’t a fan of how the ends looked like. I’m not sure if it was because of the hair piece or the way the salon finished them but they weren’t as neat as how other extensions look after dipping them in hot water. Hair Shaming – Are You Also Guilty of it? where can you buy the hairpiece for the twist in South Africa? and whats the name of the hairpiece pleeaassse ?? aisha! love the swimsuits too. finally get to see Mr FroandI . u giving me goals. 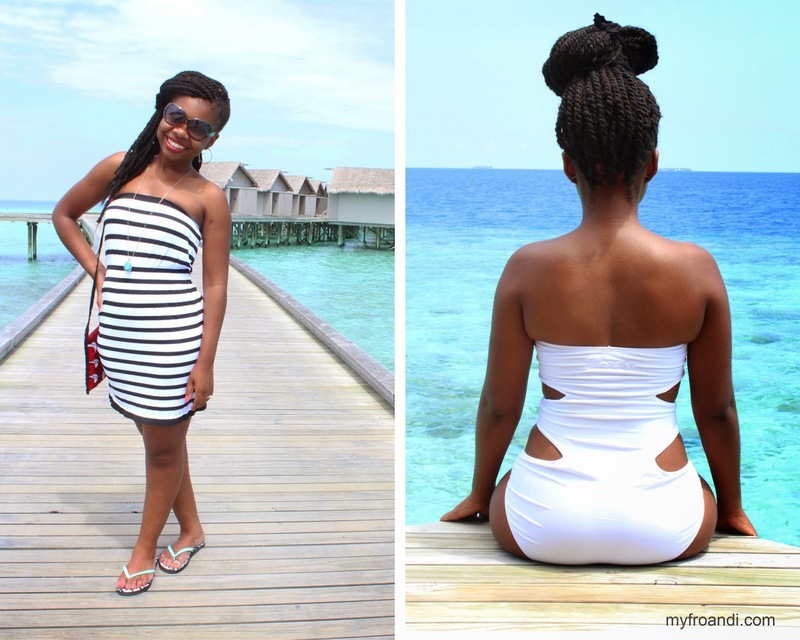 from the matching his and her fragrance to this epic honeymoon destination! I love the swimsuits, very elegant! 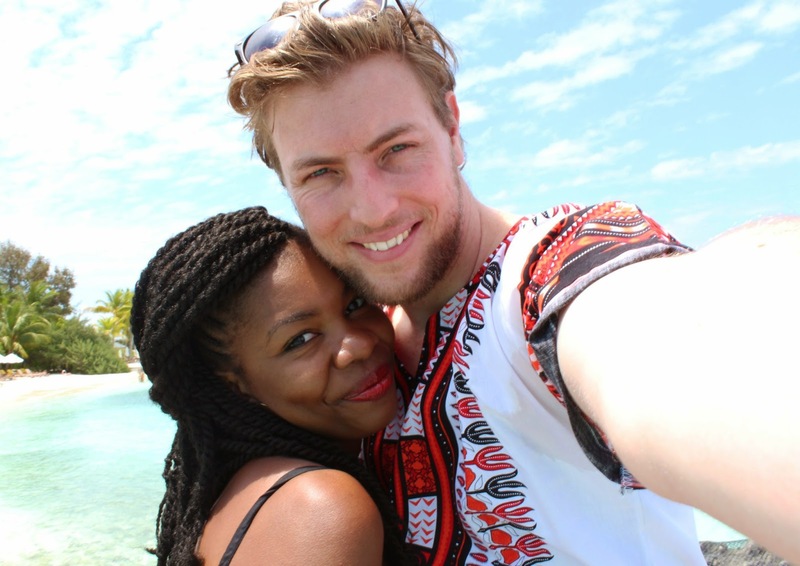 Oh wow, gorgeous honeymoon pictures. And that white bathing suit is to-die-for. Pretty please where can I get it? PREACH IT SISTER!!! 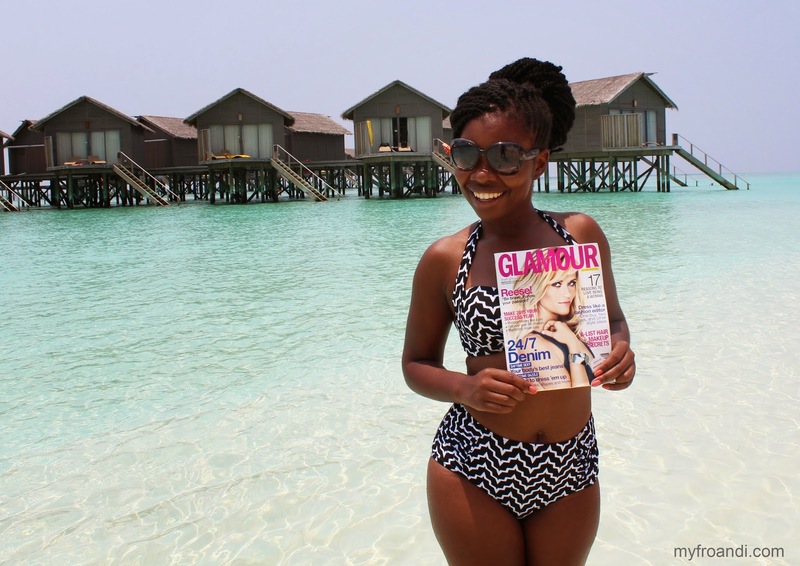 I'm going through the pictures like " Wow, so beautiful… look at the surroundings… love the swimsuits… oh wait, something about hair…. 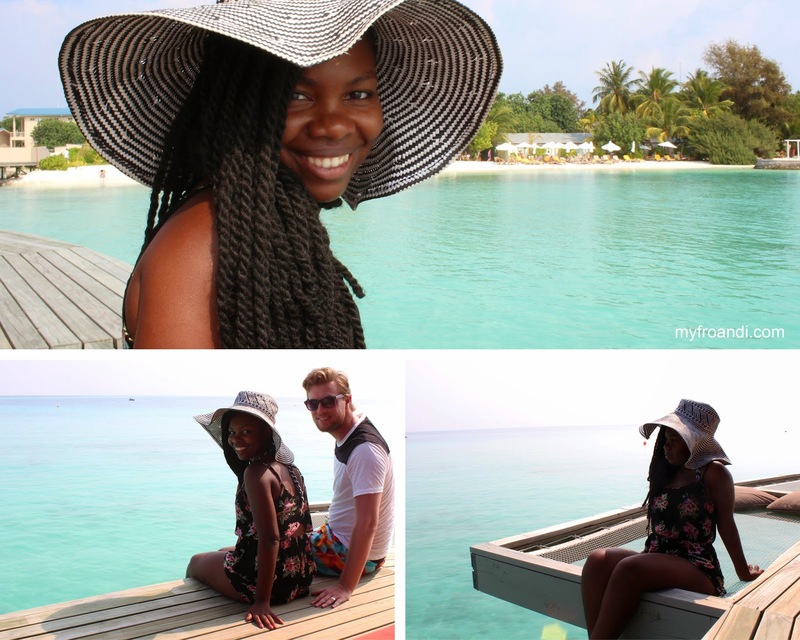 stunning scenery…beautiful couple… uh huh, hair this and that… Maldives…"